This app note covers Rosetta Stone features and Rosetta Stone price. It mentions benefits or advantages of Rosetta Stone Language Learning Software app. Rosetta stone Inc. is a software company which develops education technology related products. The company develops language software, literacy software and brain-fitness software. The company has been founded in 1992 and has been expanded in 2013 after acquisition of many companies. The company has headquarter in Arlington, Virginia, US. They are best known due to language learning products. The figure-1 depicts snapshot of Rosetta Stone software. 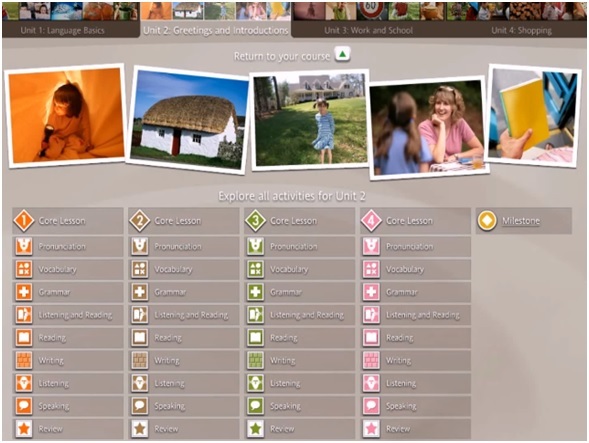 Following are the features of the language learning software. • The software is categorized based on learner's speed into slow, medium and fast. • Rosetta software language learning course is divided into various units and each unit is packed with various activities. • The units include language basics, greetings and introduction, work and school, shopping etc. • The activities in language basics include pronunciation, vocabulary, Grammer, listening and reading, writing, speaking etc. • All the activities are based on interactive sessions and feedback is provided by the software for verification or review. • Online teachers are also available for providing actual verbal communication practice. • Instant download/CD-ROM version supports upto 5 users. • Rosetta stone supports about 30 languages which include Arabic, Chinese (Mandarin), Dari, Dutch, English, English (British), Filipino (Tagalog), French, German, Greek, Hebrew, Hindi, Indonesian, Irish, Italian, Japanese, Korean, Latin, Pashto, Persian (Farsi), Polish, Portuguese (Brazil), Russian, Spanish, Spanish (Spain), Swahili, Swedish, Turkish, Urdu, Vietnamese etc. The Rosetta stone software is priced as per different levels provided. Following are prices fixed as per number of levels. ➨The software is interactive in nature and provides live online tutoring with language experts. ➨The software is very comfortable to use as it can be used in various operating system devices viz. windows, Mac, iPad, iPhone, android etc. as per their need and availability. ➨It includes games and activities so that users do not get bored. ➨The price for single level is very affordable so that users can buy and try one level to feel the great features of the Rosetta Stone software. ➨The software is built using advanced speech recognition software in order to verify speaking activity during practice sessions.